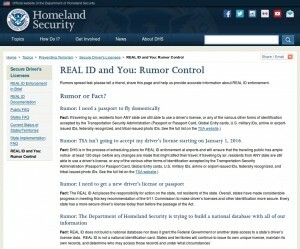 DHS posts new lies about the REAL-ID Act | Papers, Please! DHS posts new lies about the REAL-ID Act – Papers, Please! 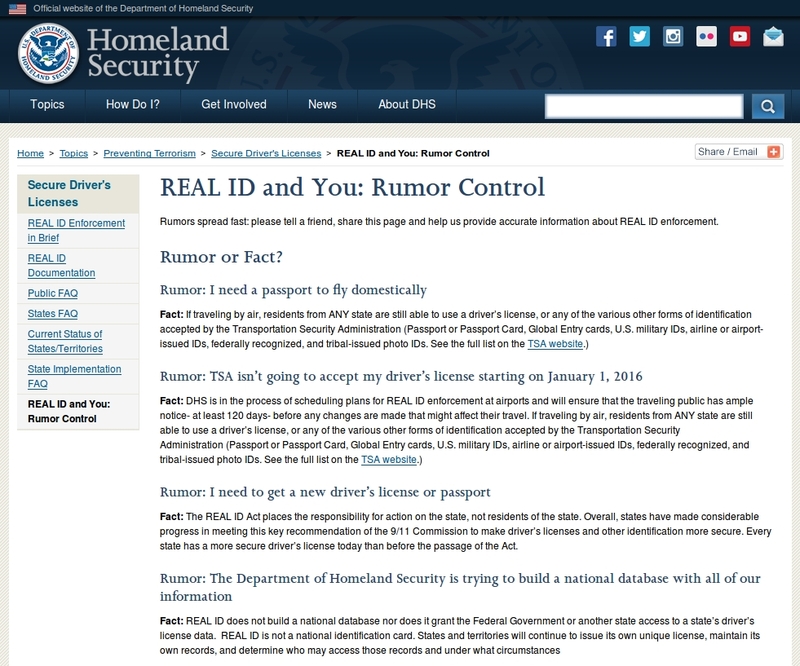 In response to a flurry of publicity kicked off by a story last week in the New York Times in which we were quoted, the DHS has posted several new or updated pages about the REAL-ID Act on its website, including a new page headed, “REAL ID and You: Rumor Control“. (12) Provide electronic access to all other States to information contained in the motor vehicle database of the State. (B) motor vehicle drivers’ histories, including motor vehicle violations, suspensions, and points on licenses. The REAL-ID Act won’t require you to show ID to fly. But unless the REAL-ID Act is repealed by Congress, it will require states to grant all other states access to drivers license and state ID data or risk having the DHS try to harass residents of those states that don’t participate. As we’ve discussed previously, the main point of the REAL-ID Act is to intimidate or otherwise induce state governments into creating a distributed national ID databases, through which a single query roted through a national “hub” (operated by a private contractor, the AAMVA) will be able to retrieve data, including standardized digital photographs, from the drivers’ license and ID databases of all 50 states, the District of Columbia, and US territories (Puerto Rico, Guam, U.S. Virgin Islands, American Samoa, Northern Mariana Islands, etc.). The DHS is lying about what the REAL-ID Act requires because it knows that the real point of the law is the distributed national database and its contents, and because most of the opposition to the law by individuals, civil liberties advocates, and state legislators and governors is based on opposition to this distributed but functionally integrated and national database. Since the DHS has no authority to compel state governments to “comply” with the REAL-ID Act, the DHS is relying on threats — most of them empty. The latest official statements posted on DHS.gov send a clear message to state officials trying to decide what to do about the REAL-ID Act. That message is that the DHS lies about the REAL-ID Act. If you want to know whether the REAL-ID Act (or any provision of Federal law or regulations) even purports to require anyone to show any ID to fly, read the law: It doesn’t. If you want to know whether the REAL-ID Act would require states that want to “comply” to connect their state drivers’ license and ID databases to the national “hub” that gives all other states root access to that database, read the law: It does. Don’t believe the DHS lies, and don’t take DHS threats at face value. Why is the News outlets of USA carrying the lies of the US government when the RealID Act says what they really intended its in the document. The main stream Media is being make to look like they have a gun to thier editorial head. The American people know the MSM doesn’t have to tell the truth. But when the undeniable facts are in the public domain. The media looks like the Department of Truth as portrayed in Orwell 1984. It’s time to stop being Fifth Columnist and realize the American people are not the Enemy. Stop being the propaganda arm of the dictates of a misguided failed bureaucracy. Pingback: DHS continues to extort participation in REAL-ID database | Papers, Please!